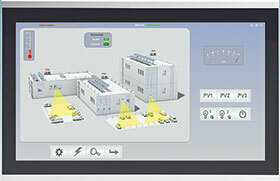 Phoenix Contact is equipping its Embeddedline panel PCs with new functions in order to offer even greater flexibility. Users can now choose between the Intel Atom E3845 quad-core and an E3827 dual-core processor, which covers a higher temperature range. The industrial PC can also be equipped with a robust 2.5” SSD with 240 GB. Those wanting a standard operating system can use Windows 7 Professional. The devices in the Embeddedline range with IP65 protection (on the front), LED technology, multi-touch operation, and displays from 7 to 18,5” combine an attractive design with powerful technology. Equipped with powerful processors from the Intel Atom E3800 series (Baytrail) and Intel HD Graphics, they are particularly suitable for process visualisation tasks. The low current consumption and completely fanless design ensure energy-efficient, durable, and maintenance-friendly operation and monitoring.